I had a teacher once tell me that although not forbidden, it is not advisable to have the same two voices move from a perfect fifth to a perfect octave (specifically referring to a four-part chorale for SATB chorus). I don't see any reason for this and haven't been able to find anything that addresses that issue specifically. Is that true? And if so, why should it be avoided in good voice leading? This can be seen between the tenor and bass in beats 2 and 3 of this bar. I have to respectfully disagree with the individual that made this claim. The fact is that it's very common for a perfect fifth to move to an octave; we see it all the time in the V–I progression! If neither the soprano nor the bass are involved, it's fine. If one of the voices moves by semitone, it's fine. If the upper voice moves by step, it's fine. Not knowing the individual that shared this stipulation with you, I can't say which rule s/he prefers. It's also possible this individual was referring to the fact that two voices "fuse" together when in perfect intervals, and the whole point of counterpoint is for these voices not to fuse together, but rather be independent. Perhaps they felt that two consecutive perfect intervals, even of different sizes, led to this fusing? But that's not a rule that I'm familiar with. or generalized from a rule of counterpoint of 2 voices. There is fundamentalism in every subjects - not only in religion. In four-part harmony, this rule is not on the "most important" list, but the perfect intervals, sounding so open, can draw attention to themselves when one is followed by another. This can make them stick out in a chorale setting where it contrasts with most of the movement. When the two voices are moving in the same direction, this effect is exaggerated. It can usually be avoided. Often in V-I cadences, if the soprano is on the 2nd scale degree moving down to the tonic, and the bass is in root position moving from V-I, the movement from a P5 to a P8 is in contrary motion, which lessens the effect. There are many choices that need to be made when part-writing. Sometimes there is no better choice than to move from a P5 to a P8 between two voices, in order to avoid worse movement somewhere else. Not the answer you're looking for? Browse other questions tagged theory harmony voice-leading or ask your own question. 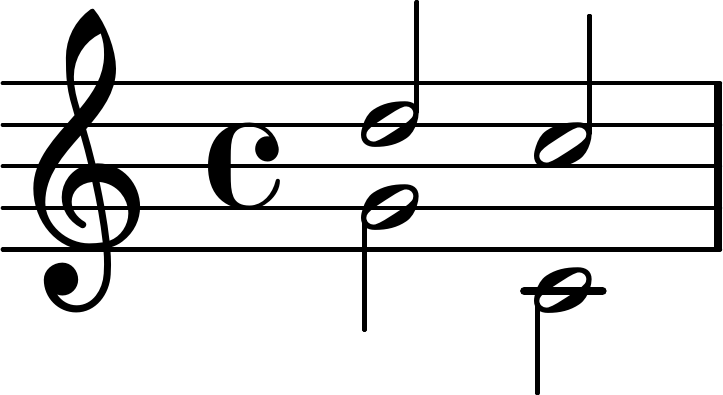 What is a perfect fifth? Is two singing voices occasionaly being unison “allowed”? How many (parallel) harmonies can we have in a song without one harmony being an octave apart from another? Is it allowed to move from Perfect Fifth to an Octave between Bass and Tenor? What does Satb theory say about moving octave C into a perfect fiftth? Can I have two different instruments play the same melody at the same octave?